'Burb Tales: Pizza Amore! Plus Giveaway! 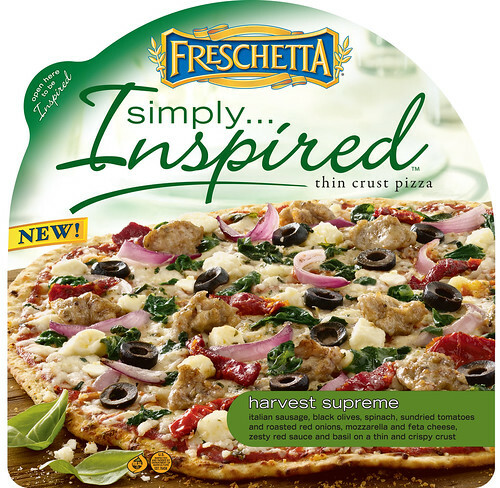 I was recently contacted by Freschetta to do a review of their new FRESCHETTA® Simply…Inspired™ pizza line, and I have to say I was THRILLED! Needless to say, we're really impressed with the flavors and the quality of Freschetta (the proof is in the pudding, er freezer! ), so a *new* line of Freschetta gourmet pizzas is right down our alley. To try out the Simply Inspired line, we chose the Harvest Supreme variety, which is not exactly your standard "supreme" pizza... but I'll get to that. The first thing I noticed was the packaging - Freschetta is using a new type of packaging that not only keeps the pizza fresh, but it's 30% less material than their standard packaging. For those of us always looking to throw less into the landfill, this is really great. The fact that companies are now taking notice and making efforts to minimize packaging is even greater! Did I also mention the gorgeous cutting board I received from Freschetta? (I have a cutting board, yes, but it's not nearly so classy as this one.) Made of bamboo, it has slots for utensils and a cute little dish for say....some olive oil and balsamic for our next Italian night? BUT - did you know YOU CAN WIN A FREE PIZZA AND CUTTING BOARD, TOO??? I'll use a random number generator to pick a winner in one week! Normally, I like Tombstone's Pepperoni, but now I can't wait to try Freschetta's thin crust! FYI - comments are being emailed to me but are not showing up here for some reason! If you're having trouble with the comment form, feel free to email me to enter the drawing - there are only THREE entrants so far, so you have a great chance of winning!! I like the classic brushetta..Simple is best.